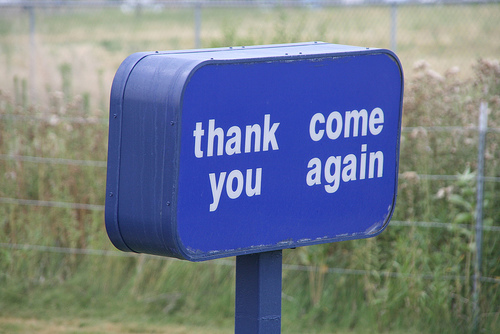 “Thank you so much for coming in” – Thank you so much for finally leaving. OMG…. I so hear you on that one. Even when people are nice, there is a shelf life on a restaurant visit. I have small kids, and the worst thing about going out to eat is how long it takes us to leave! It’s embarrassing. We pay the bill, and 20 minutes later we are still trying to get coats and shoes on! I always tip extra to compensate.